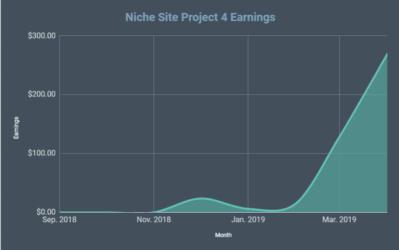 If you have ever wanted to start a a blog or website that is monetized by the Amazon Associates program, then I have a few tips that may help you get started. Or if you currently have a site where you are wondering how to use Amazon affiliate links most effectively or the process of inserting your links using WordPress, I have a few ideas that will make you more money. I started my online journey with Google Adsense, and that is where I've made a lot of my money in order to quit my job. 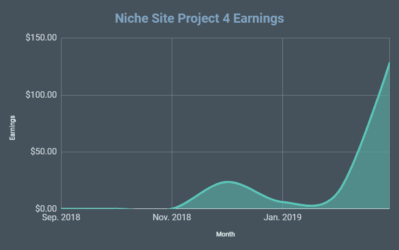 However, after conducting a few niche site projects, and starting a few other sites on my own, I've learned how to use Amazon affiliate links quite well over the years. In fact over the past couple of months, I've learned some things that I never knew before, and wanted to share. Making money through affiliate marketing in general can be quite profitable. Promoting Amazon products is perhaps one of the easiest affiliate programs to join and tends to have a great conversion rate because everyone is familiar with buying from Amazon. This can result in higher affiliate commissions for you. There is nothing more frustrating that having a problem and not being able to find an answer; so, hopefully this post can answer a few basic questions in regards to making money with the Amazon associate program as I teach you how to use amazon affiliate links. There are a couple of different ways that you can insert Amazon affiliate links on your WordPress or other affiliate sites. First, you can use different options provided directly by Amazon. You can do this with any theme you've picked and some WordPress themes have more ready to use interfaces to allow direct linking from amazon more readily. Login to your Amazon Associate Account. Find the products you want to promote on Amazon and click the option you want to use in the Amazon Associates site stripe at the top of page. Copy the code for the link from the Amazon popup window. 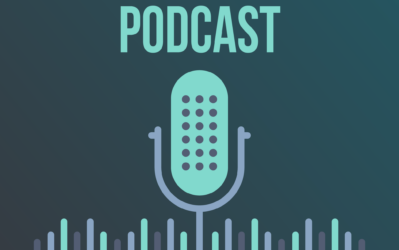 Paste this link in your blog post, on social media, or other location on your site where you want to promote products. 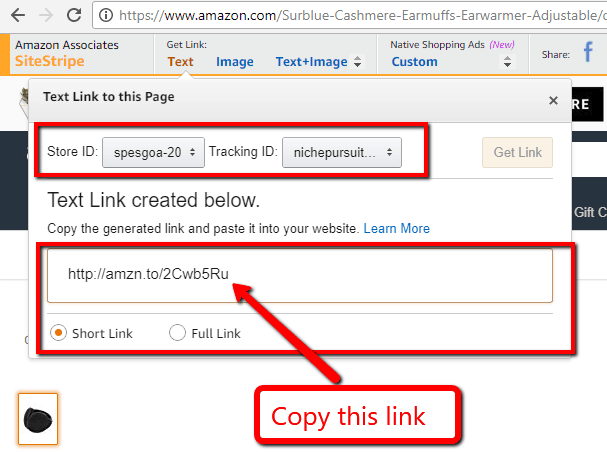 Here's a bit more in-depth description of how to get your Amazon affiliate links, with images to guide you of course. As you can see, you can click either Text, Image, Text + Image, or Custom Native Shopping Ads. Finally, you can also share directly on Facebook or Twitter by clicking the Facebook or Twitter icons. I typically will just select the “Text” option and then highlight just the link code itself (as shown in the image below). Then I can use this affiliate link anywhere I want on my site (with an image, my own anchor text, on social media, or anywhere else I chose). However, you can explore the various link options to determine what works best for you. All you have to do is copy that link from Amazon, insert it into your website, and you'll start earning commissions whenever people buy products on Amazon through that link. However, it's important to note that you have the correct Store ID and tracking ID selected. Just be aware that whatever tracking id you select is where the commissions will show up on your earnings report from Amazon. Another pro tip is to decide if you want to use a short link or the full link (as shown in the image above). I would recommend using the full link if you EVER think you will sell your website. I have purchased and sold a couple of Amazon affiliate websites, and it's MUCH easier to find and replace (using a WordPress plugin) the old Amazon tracking id and replace with the new one when the full link is used. (The short link doesn't show your tracking id, so it's impossible to find). You can also click the “Custom” link and get an embed code that includes the price, image, description, and buy button. This makes your links more obvious, which can be a good or bad thing depending on your blog post or site that you are using it on. However, you should probably explore these options in your Amazon associates account to determine which type of affiliate links are the best for you to use. Now that I've covered what Amazon has to offer, I want to share a couple of other tools that can assist in using Amazon affiliate links on your website. 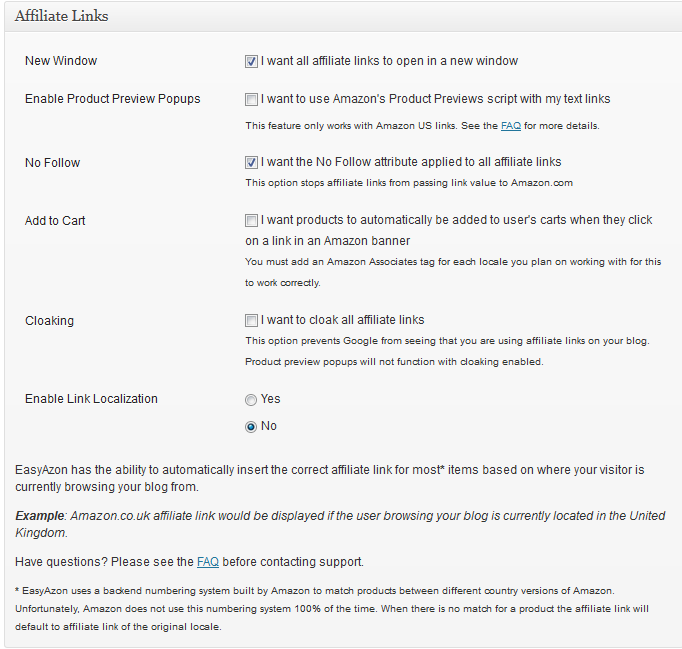 Another option for how to use Amazon affiliate links on your site is to use a WordPress plugin (if using WordPress). For many of my niche sites, I am using the EasyAzon Pro Plugin. The EasyAzon plugin makes it very quick and simple to insert Amazon affiliate links without ever having to leave your WordPress dashboard. So, rather than going over to Amazon.com to find your product and then copy and paste the link, you can have the plugin do it directly for you within WordPress post or page. So, this is located directly below where you create a post in your WordPress text editor. 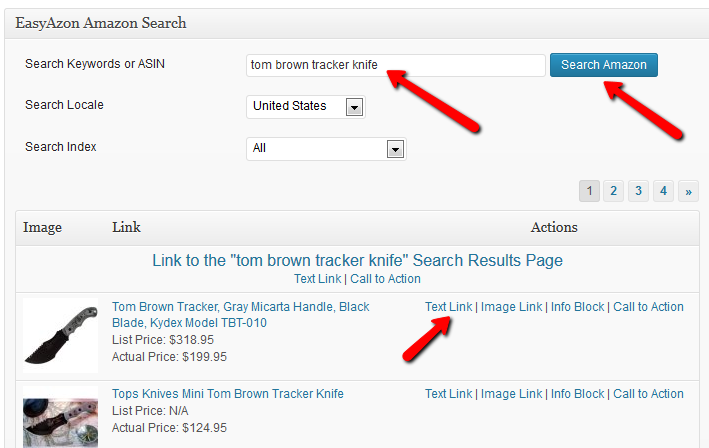 All you have to do is type in your search query (mine is “tom brown tracker knife” above), then hit search. 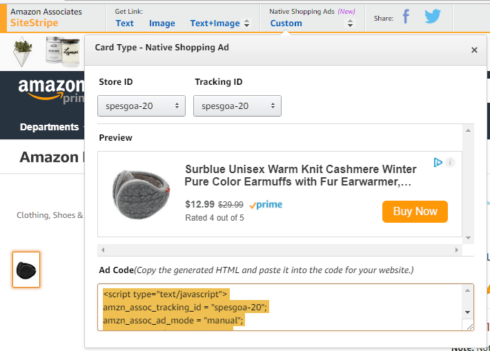 This will pull back all the Amazon results using the Amazon Product Advertising API, as you can see in the image. 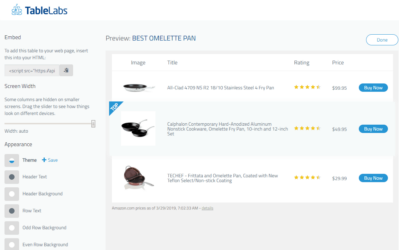 Using the product advertising API from Amazon ensures that you stay compliant when using images, prices, and other product details. Then simply select whether you want a text link, image link, info block, or call to action. In the link text box, you can change your anchor text to whatever you want. You can see that I made it, “Click Here for Pricing, Reviews, and More…”. Then simply clicking “Insert Shortcode” and your Amazon affiliate link is all set! I like having a custom anchor text because it can increase clicks, which can then lead to more sales. You will notice at the bottom of the image above that you can, “Enable Link Localization”. What this does is detect what country the user is from that clicked your affiliate link and direct them to the correct Amazon country page. In order to get paid when a user from the UK purchases on Amazon.co.uk for example, you MUST be approved to the Amazon.co.uk program; which is different than the Amazon.com program. In other words, you need to apply and be approved for each of the countries for this function to work. Well, it sounded like a lot of time and effort to apply to multiple countries; so I just figured I'd stick with the US only when I first started creating niche sites. However, I was contacted by one of my readers who told me that it only takes a few minutes to apply to each of these programs, and that it could increase my income by over 15%! To be honest, the only reason I hadn't applied to the other country affiliate programs was because I thought it would be too time consuming. I was definitely wrong about that! I've now applied to Canada, UK, and others. I now use the EasyAzon plugin to automatically localize the Amazon results for each person that clicks my affiliate links and I can see that I was missing out on sales from this international traffic. I mention this in case there is anyone out there just get started with the Amazon Associates program. This is a simple tactic that could definitely increase your overall earnings. 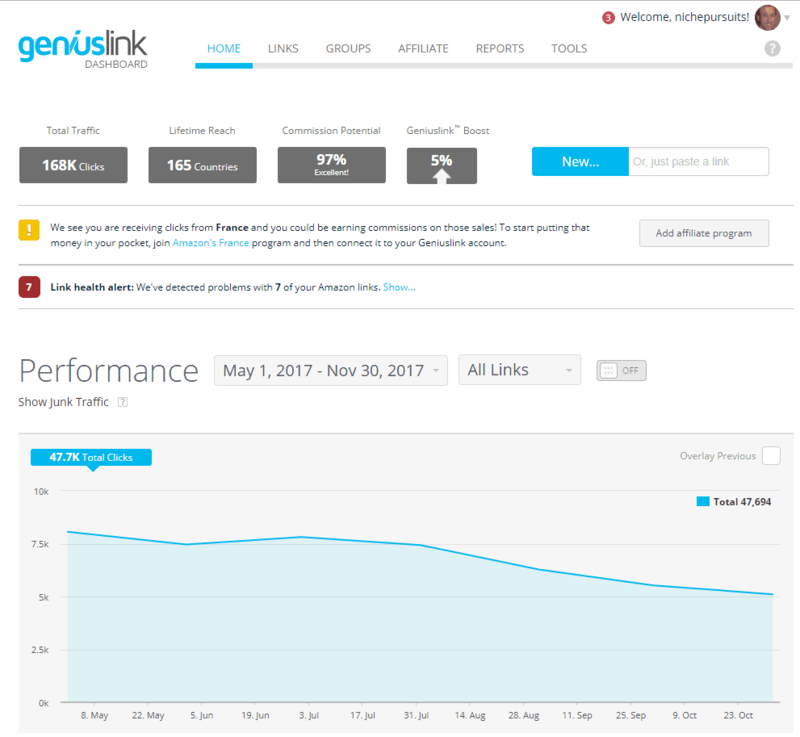 Another great tool to help you monetize traffic coming from all over the world is Geniuslink. Genius is a SaaS based tool that can work with their WordPress plugin or any other type of website. I use Genius links on a few of my niche sites and have never had any issues. When I look at where my traffic is coming from, you can see that people from 165 countries have clicked on my Amazon affiliate links. So, even though I've applied to the largest Amazon countries, I'm likely still missing out on a little bit of commission each month. Another option to localize your links is through a relatively new option directly through Amazon called, OneLink. 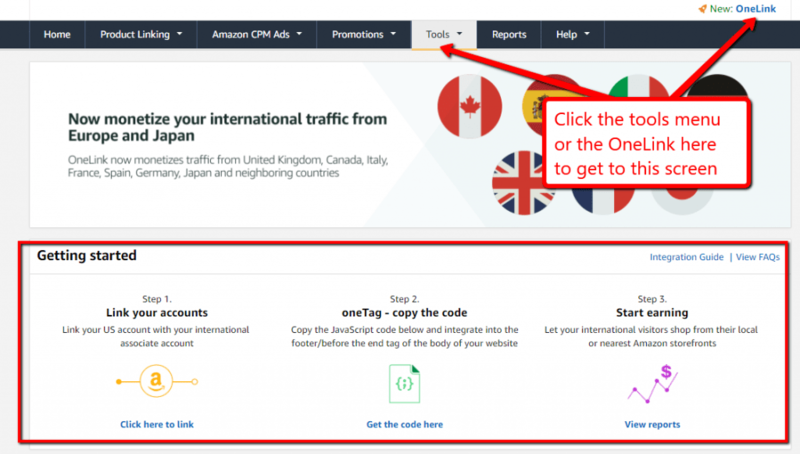 Amazon OneLink does the same thing as the EasyAzon Pro Plugin and GeniusLink; it takes international traffic clicking on your affiliate links and sends them to the appropriate Amazon country (i.e. Amazon.co.uk, amazon.ca, etc). In your blog posts as text links. 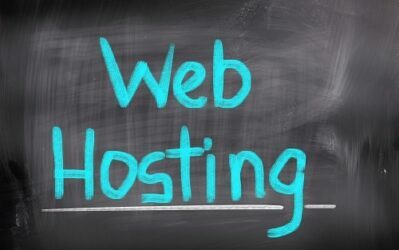 This might include your WordPress blog, but could also be Tumblr blog, Blogger, Medium Blog, Weebly Blog, or any other blogging platform. The concept of inserting your Amazon text links is essentially the same on each platform. In your in-depth “buying guides” that review Amazon products. You can see some great examples of effective use of Amazon links and in-depth buying guides at theWireCutter.com. In your WordPress sidebar to highlight a special offer or favorite product. Use Amazon native ads or banners strategically placed within your content. Consider used the Ad Inserter WordPress plugin to have the same Amazon native ad show up at the end of each of your blog posts for example. In product comparison tables. I recently did an in-depth tutorial of how to create product comparison charts that you might find useful. Or if you are looking for a great software tool that automatically creates great looking Amazon product comparison tables for you, consider the software I created TableLabs.com. On Social Media; including Facebook posts, Instagram Posts, and Twitter posts. As mentioned earlier, Amazon has no problem with you posting affiliate links on Facebook and Twitter. In fact, they have the Facebook and Twitter linking tool built right into the Associate SiteStripe. However, I've found that my own experiments with posting links on social media haven't worked that well. YouTube. If you are building a following and review products, it's a no brainer to add an affiliate link in your video description. You could even mention a pretty link or other short link in your video that people could type into their browsers. Store pages. You can create a “store” page on your website and create your own product listings that are all just your affiliate links. Fresh Store Builder is a tool that makes this SUPER easy and turns out great looking pages. If you want to create your own custom affiliate link you can use a free WordPress plugin called Pretty Link. This plugin simply makes really long links short (it's a link shortener). I use Pretty Links all the time. 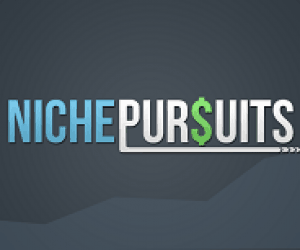 For example, NichePursuits.com/earmuffs, is now my Amazon affiliate link. (Goes to the earmuffs page I was taking screenshots of earlier in this post). 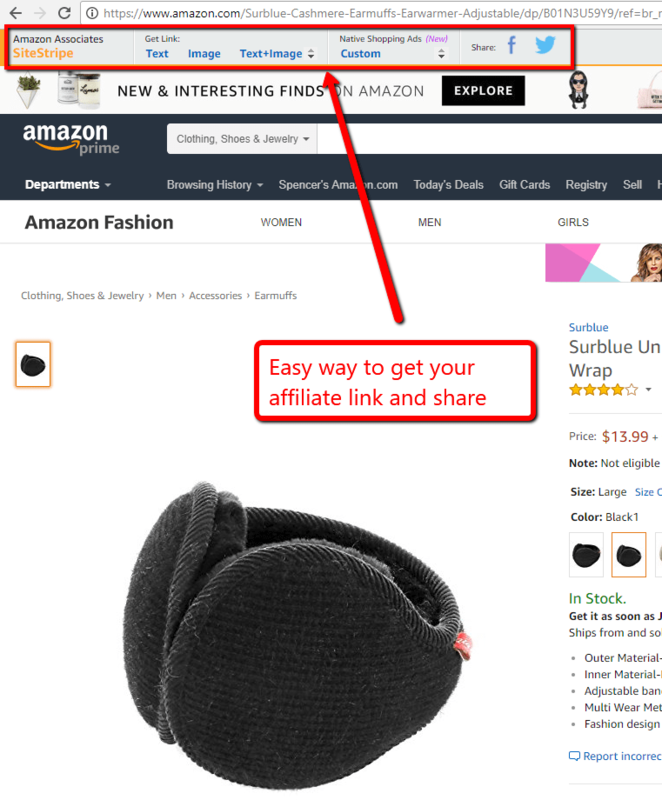 If you are getting started using the Amazon Assoicates program, hopefully some of these tips I've shared about how to use Amazon affiliate links will be useful to you. Amazon provides lots of different options for inserting links into your site that can be quite helpful. However, you can also use tools like EasyAzon, GeniusLink, or even Table Labs to help you effectively add links to your site. These plugins and tools allow me to get things done a little bit quicker and provides some advanced options that I may not be able to accomplish otherwise. Do you have any questions about using the Amazon affiliate program? I'd love to hear your comments or questions below. I sent you a message about my issue with long tail platinum, till now I can’t get it,,,. anyway the EasyAzon plugin seems to be a nice choice, I think I’ll get it through your link. I use easyAzon and I like it’s quikness. My testing has shown better page rank with the links cloaked. Thanks for putting me on to this plugin. I thought I was doing something with a little trick that I had realized a few weeks ago but this is even better. Just so you know you can just copy the text from the preview and it will maintain the link. But this plugin makes it even easier than that. Are there any views on how Google reacts to cloaking? Seems a bit “black hat” to me and I suspect Google doesn’t favor it. Mark, here is my 2 cents on that – Google cares about the user experience and too many affiliate links = bad user experience as Spencer found out when his site got penalized. So by cloaking a link and making it a no-follow they are not “supposed” to end up knowing it is an affiliate link. However, take that with a grain of salt since they can tell its a cloaked link and then penalize cloaked links the same as affiliate links. But the argument with cloaked links is they are really just another fancy way of creating trackable links which are used for all kinds of moral/immoral reasons. Perfect timing Spencer. I have just spent 24hrs looking at so many Amazon plugins. Talk about analysis paralysis. I have been having so much fun with Long Tail Pro I didn’t hesitate to follow your recommendation on EasyAzon. I hope it lives up to its name of being easy! My hesitation with EasyAzon is that it doesn’t seem to give you the same ability as other plugins to track the links. I use a combination of PrettyLinks and Google Analytics so I can see which links are getting clicked on but what type of visitor. But for quick sites where there isn’t enough data to justify collecting it then easyazon looks like a pretty slick solution. Maybe I am missing something and this functionality exists! I’ve read on some posts that Amazon doesnt allow link cloaking. I’m finding a way to track my amazon affiliate on my niche site… got a lot of clicks but dont know where they come from. Good point. Being able to track links better would certainly help optimize. if you are putting up Amazon links be sure to check the exclusions list where amazon WONT PAY on commissions. I have a friend who developed a site on xbox360 games and did a lot of work and was gutted when i showed him this list. I admit I checked your source code to find out if you were using an Amazon plugin. I like the look of easy Azon but I’m more interested in commission have you thought about an AmazonExtend? Getting a 90 day cookie on their comp could majorly boost income and in the terms it’s actually allowed. My question to you is have you heard of it? If so are you using it? If not how come? Never heard of AmazonExtend. I’ll have to look into that. Okay, actually I just did. What the plugin does is add the product to a users Amazon cart, which allow you to get paid up to 90 days later if they purchase that product. Very cool! But I also looked and EasyAzon can do the same thing already. I just hadn’t selected that option. So, I’ll look into checking the box to do that with EasyAzon…thanks! I got Easy Azon myself and added it to a few blogposts BUT I quickly asked for a refund when I realized that I would need to go through ALL links to make sure they are still valid or when I want to exchange a link. All in all it´s a GREAT help but in the long-run, I don’t think it will help a lot. This is much easier when you create a “pretty link” and then have one place where you can exchange them all. I use the ninja affiliate plugin for that. On your survival knife site, I wanted to ask if the Easy Azon plugin created the sortable listing of knives at the bottom of your home page? No. Its the TablePress plugin that made the chart. Do you know if we receive commission on items sold by other companies on Amazon? Several items that I want to review on my site have in the description “available from these sellers”. Thx again for showing us on how to succeed online. add to cart adds a 90 day window as opposed to a 24 hour window. that makes a big difference. the 24 hour is good for all products bought not just the one mentioned in the link. i am not sure if the 90 day is for that one product affiliate commission or anything that is put into that same cart for 90 days. can you check? The problem with the “add to cart” thing is that a screen shows in Amazon that says something like “Are you sure you want to add this product to your cart”…before the user even gets to view the product. So, I don’t go with this option. I have got the course and kw tool… And after going through the first 6 vids and much research I think I found a great low comp. kw to go after and already begun building my site. using a diff theme though. It would be cool if you did a video showing how you made the chart using tablepress and the easyazon plugin for the links… I have my excel sheet going but don’t know how to transfer that info into the chart using tablepress and using easyazon for the links… ugh. Thanks for all this FREE info! Really you could build a site just using the free info here. So I’m trying to localize my links and after signing up for the affiliate program in GB, I needed to provide my bank info. Unfortunately I can’t enter a US bank there. Is there something I’m missing to work around this? Thanks for the interesting article. I find the whole Amazon Affiliate setup a bit stupid. Having to provide different links to different visitors is crazy. I’m signed up with .co.uk and .com and my visitor profile is 50/50 US/UK. Link localisation is a possible solution but not 100% reliable and doesn’t work properly if you are using a caching system. Why Amazon can’t sort the localisation out for you I do not know. It would make Amazon affiliate links far more usable. At the moment they are too much effort. They need to look at Google Adsense and learn how it should be done! Hi. Interesting. I cannot afford to buy the Easy Azon plug in at the moment – just getting started and money is limited. Any other suggestions for a free one? I am using the usual Amazon link – photo and link but I don’t like how it looks on my blog – a long list and I don’t know how to rearrange them. I have logged on as an Amazon.com affiliate. I thought that if a buyer uses that link and then changes to .co.uk, it would still be credited to me. How does one sign up for both? Do you keep the same affiliate ID? That seems to be a bit confusing so any clarification gratefully received. The EasyAzon plugin will automatically detect where the users are located and serve up the correct amazon country website (amazon.co.uk, etc). You have to sign up for each countries affiliate program separately. Thanks for your answer. That is a bit of a pain, isn’t it? I am in Spain but am from the UK but so far, have been trying to target the US market which is bigger. I will try and see if I can be a UK affiliate too then. I imagine the process will be the same. But do you get a different affiliate ID? What happens if someone in the UK tries to buy through my link, which is Amazon. com, does that mean I won’t get a payment. And that doesn’t work if you don’t have the plug in? Gosh this is complicated for a newbie! It is a pain. I only found this out myself the other day. You’ll need to sign up for an amazon associates account in every country yes. Also Amazon.com seem stricter on who they allow the .co.uk. At least in my case. I am still building my site and Amazon associates .com (US) declined my application until my site was fully up and running. That means I need to build and post a ton of articles, then go back to get my affiliate account, then go back through the posts to insert my affiliate links. Thanks for the tip on this plugin Spencer as it will obviously make things a lot easier to earn commissions on various amazon stores. I have a question about Easy Azon. I hope you have time to respond. I understand what you are saying regarding locating the correct amazon website depending on location but how exactly would it work? If its not available, I still think you end up on Amazon.co.uk…but not quite sure where. You may have to contact the owner of EasyAzon to know for sure. I suspect it would take the user to a search results page. Thanks I’ll do that. I’m building a site at the moment and will purchase Easy Azon through your link. I intend to use Amazon Associates Program for my webstore as I do not have a company at the moment and my website is going to be purely freelance blog style to promote my ebook (soon to be revamped from a silly clickbank sales page, my friends trash it). The Amazon store is for me to add value to my customers reading my blog posts in future and also of course, to sell products relevant within the informative/instructional/educational posts. 2) You must use the “Add to Cart” for 90 days tracking. 3) It seems from one commenter(Monja) that it’s not easy to change/exchange all the links at once. Please correct me if i’m wrong on the above. 2) If so, is this software well supported? Updates on Amazon and WordPress would easily make software backdated and un-usable. Sorry if this comment seems too draggy. Spencer thanks so much for your clear explanation of which PART of the HTML to copy from the Amazon link when creating a link using your own image! I used to do that all the time and lately it’s been giving me errors and I’ve been banging my head against the wall trying to figure out why! I used to just copy the entire HTML for the Amazon text link, but I guess they’ve added stuff in there now that’s causing me errors – Whew! Thanks for saving me from smacking a hole in my forehead, lol!! Hi Spencer, how do you make the amazon links appear as shortcode links on your survival knife site? The amazon links show up as long code on my site if I hover my mouse over them. That plugin is little too much for me now 🙁 .. So is there is any Free plugins to try ? You can always do it by hand, for free. Spencer, Why don’t you blog all those spam comments? Make’s you blog really messy! Thank you for the heads up! I’m not sure how so many spammy comments were getting through on this post. Its all cleaned up now.